D-Day landings preparations. 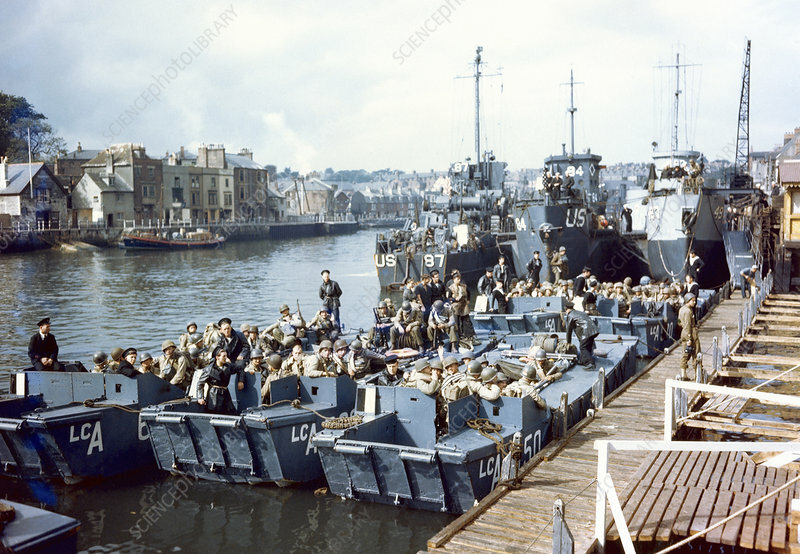 US Coast Guard ships (Flotilla 10, in background) and British landing craft and US troops (foreground) preparing to cross the English Channel as part of the D-Day landings of 6 June 1944. This was the largest seaborne invasion in history. It successfully liberated the Normandy coast of Nazi-occupied France, contributing to the Allied victory in World War II. These troops landed on Omaha Beach, the most heavily defended of the five beaches targeted and the scene of the fiercest fighting. During the D-Day landings, the Allied force of some 156,000 (from the UK, USA and Canada) took some 12,000 casualties and suffered more than 4000 dead.